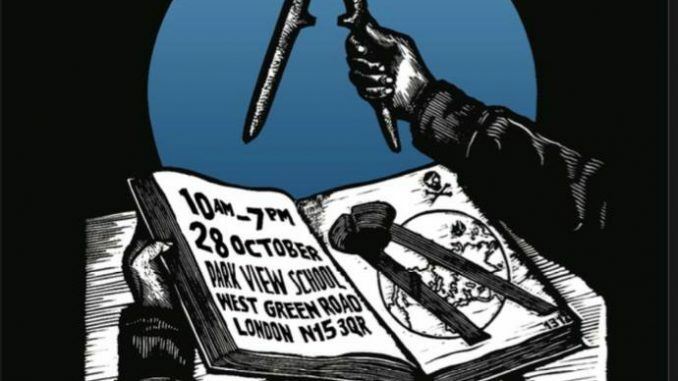 It has been over a month since the London Anarchist Bookfair and as a movement we are still reeling, with deep divisions between people who had respect for each other and once worked well together. We are still shocked, horrified and saddened by events as are most people, no matter what perspective or interpretation they have on what happened and the role of the Bookfair collective. We were, until recently, members of the AF who did not sign the initial statement that was issued by Edinburgh AF and signed by two other AF groups, nor did we support the statement issued by other campaigns and organisations. We did not want to respond immediately as there are so many issues involved and emotions are strong. We hoped that after some time we could give a political assessment of the situation rather than just a knee-jerk reaction based on our emotional response to events and statements from other groups. Whether this is in fact possible is another matter. Firstly, it is important to outline the political tradition that we are part of. We call ourselves class struggle anarchists or anarchist communists. We are a distinct tradition within the anarchist movement and have always been critical of other currents in the anarchist ‘movement’, including liberalism, individualism and anarchism as a life style choice. Our aim is to create an anarchist communist society. This can only be done by the mass of the working class (broadly defined as all those who have to sell their labour power) developing an effective revolutionary movement that overthrows class society, the State and all forms of authoritarianism and oppression, where people take control of society and their lives and can live co-operatively, without inequality and injustice and with freedom to be who they want without coercion. It is not just a question of overthrowing capitalism as an economic system but also the other oppressive structures and ideologies that are an integral part of the current system. This goal has proven to be remarkably difficult. Most people in the working class, though suffering under the system and often critical of it, are still reluctant to join us in building a revolutionary movement. And, within our own class, there are major divisions that are the result of centuries of social systems and ideologies such as patriarchy, racism and the colonial legacy, hostility towards those who go against the norm in terms of sexuality and gender. This is why we support oppressed groups to organise autonomously. However, we still need a united movement. The big question is how do we actually build a united movement when such serious divisions exist and in which many are suffering at the hands of other working class people, including people within the anarchist movement itself? Our answer to the first issue is that we need to make sure as anarchists we are directly involved in struggle, in the workplace and the community. Without being part of working class struggles we cannot hope to convince people that a revolution is both desirable and possible. In addition, we need to be explaining to people what anarchism is, giving possible ideas of what a future society might look like as well as give an anarchist analysis of what is going on at the moment. We cannot get anywhere by staying within our own ghettos, relating only to people who agree with us and writing for social media sites that are only read by the already ‘converted’. The tendency towards practices that are inward-looking, destructive, self-referential, etc is not revolutionary. You need an outward-looking, expansive, genuinely inclusive approach that accepts degrees of difference if you want to change the world – or simply save your local library or support a group of workers in struggle. Our answer to the first question influences our answer to the second one. We need to be fighting against patriarchy, eg for reproductive justice and against domestic violence, and against bigotry of all kinds that leads to discrimination, bullying and violence, from within the working class. We need to challenge how capitalism and the State create, use and reinforce any oppressions that they can make use of. However, we need to do more than this- we also need to challenge these ideas and practices within our class. The key thing to stress here is that the people we are talking about are still our class. Yes, there will be some who go over to the other side and became major obstacles to social change, eg those who become fascists. Nevertheless, we still have to see the majority of people as basically potentially on our side or we will never have a revolution and create the kind of society we want to live in. This was the mistake of the Bolsheviks (amongst others! ), thinking that they could impose a social system on people. This task is enormously difficult as we are all, to some extent, prisoners of an all-embracing ideology that we are often not aware of which means everyone will bring with them into a working class movement, and more specifically an anarchist movement, a range of prejudices and practices that are incompatible with creating anarchist communism. So how do we address these issues without treating the people we are working with as enemies in the same way as the ruling class is our enemy? In recent years, within the anarchist and general activist movement, there has been an increasing amount of people called to account for their actions and beliefs. This could be seen as a positive thing- oppressed groups are gaining confidence to speak out and not willing to put up with unacceptable behaviours from those they are working with. However, what could be seen as positive has now become a hindrance to positive engagement with people whose actions are unacceptable in some way. Using the concept of safer spaces (again potentially a positive development) more and more people are ‘called out’ and, rather than dealing with problems in a more informal and personal way, are put through accountability procedures that in the vast majority of cases don’t lead to a desired outcome where the person is reintegrated into the group. Instead, much resentment is created. Often news is spread through social media- ‘outing’ the person who has been accused. The social media gossip machine comes into play and the person is ostracised and treated as an ‘untouchable’. It is not a way we should be treating people who are our comrades and not the class enemy. If a movement or organisation is too inward looking, there can even be a tendency for people to look for examples of inappropriate behaviour that they can expose. The intentions behind the various policies that have been put in place are usually based on a sincere desire to try and eradicate oppressive behaviours in the movement. But the end result has become an oppressive, authoritarian system in itself, resembling the Cultural Revolution in China in which Red Guards (guardians of the revolution) set out to expose ‘reactionary elements’. The way they went about it involved humiliation, emotional and physical abuse and even death for the accused. People were afraid to speak out and people denounced their neighbours and workmates and even their own family. This is certainly not something that is compatible with the way we envisage an anarchist communist society. The women who came to the Bookfair to distribute leaflets against the Gender Recognition Act certainly came to provoke a debate and ended up negatively disrupting the Bookfair. Helen Steel in her support of their giving out the leaflet (though she herself did not write it or hand it out) has been criticised. However, the reaction of what can only be described as a mob is completely unacceptable. Keeping in line with what we argue above, no one of our comrades should be treated as the class enemy and be intimidated physically or emotionally. Helen has been a comrade and an active class struggle anarchist, involved in campaigns and struggles for decades. At the Bookfair itself she was involved in giving two meetings and personally has been under serious attack from the State. This does not mean that she was right but she should not be challenged by a mob. If people disagree with her views on transgender issues, then there are other ways of expressing them. And this leads on to the next question. What exactly is a correct line on transgender? Increasing numbers of people are questioning their gender identity and seeking to re-identify as the other gender or to reject all gender labels and refer to themselves as non-binary or gender-fluid. However, the way the debate is often framed is, ‘there is no debate and it’s not up for discussion’. In other words, there is only one ‘correct’ position with no room for a nuanced understanding, and the trans activists and their ‘allies’ in the anarchist and other political scenes hold exactly that position. However, it’s worth pointing out that not even all trans people agree with this ‘correct’ position. Yet anyone who disagrees or attempts to take a nuanced view is labelled a transphobe or a TERF which means that they immediately move to a ‘beyond the pale’ status where they are the enemy. Therefore it is perfectly acceptable to hurl abuse, physically evict them from spaces and send death threats. We acknowledge that within the wider feminist movement, there are some deeply offensive views and comments with regards to trans women that can only be described as hate speech. At the same time, to disagree even slightly with the view that transwomen are women in the same way as those who were born female and have been socialised to be women is often seen as hate speech. Clearly, it isn’t. Trans women and those born and socialised as female often face very different challenges which may need to be dealt with in different ways, even sometimes separately. To acknowledge this is not ‘transphobia’ and doesn’t make someone a ‘TERF’ (although we are aware that such ‘difference’ is made a point of emphasis and weaponised by some of the more unpleasant elements in the feminist scene). The choice seems to be to accept, without question or nuance, the view that transwomen are women or be moved to the category of enemy that is normally reserved for the likes of fascists, rapists and capitalists. It seems that most people prefer, therefore, to just keep quiet. This situation is toxic. We should not be in a situation where people who are all struggling for a better society are unable to have open and comradely discussions about their views. It may be difficult but it is essential if we are not going to tear ourselves apart. The statement written by Edinburgh AF and also the Open Letter signed by a number of other groups not only supported the actions of those who sought to physically evict Helen. In fact, its main purpose seemed to attack the Bookfair organisers. There are many serious problems with these statements. Many points were already addressed in the reply from the Bookfair Collective. Here we will discuss the political issues with the statements. Firstly, again we have a situation where individuals are ‘called out’ or denounced in rather aggressive and abusive tones, treating real people, most of whom are well known personally by many in the movement, as if they were strangers- strangers who deserve no respect or consideration for their feelings. And, these criticisms are made by people who have had no involvement in organising the Bookfair. Many of those signing statements are not anarchists and did not have stalls or meetings. It is not acceptable to make such a negative statement from such a position. People certainly can criticise, but it should be constructive criticism, recognising all the positive aspects of the Bookfair and offering to help to improve things. Now some are saying they will organise bookfairs; they will soon realise how very difficult it is. One area that was criticised was the issue of security. People running bookfairs have many difficult decisions to make about having an open, public bookfair and maintaining security. You can draft all the statements and policies that you want but it is impossible to prevent anyone who is intent on disruption doing so. Last year’s disruption of the Syrian meeting was an example. The collective has tended to go for openness. They are a very small collective and would find it very difficult to ‘police’ everything that goes on or to stop individuals coming in. In order to stop any disruption you would need a very big ‘security’ force as well as know who you were going to stop going in. And before that you need to decide who can’t come in. The implication of the statements critical of the Bookfair collective implied that the collective should be checking any publication that was being sold or distributed as well as having a long list of banned individuals that different people find offensive. This would make for a very different atmosphere- very authoritarian. So it is not so easy to get the balance right. There is also a serious political contradiction in the statements. The Bookfair collective was accused of racism. This referred to their ‘allowing’ slogans such as ‘religion is stupid’ as this might be considered offensive to religious people, many of whom are Black or Asian, it is racist. There are several problems with this. Firstly, as anarchist communists, and we assume other anarchists, we are against religion. This is because all religions are irrational, based on authoritarian structures and are one of the main ideological supports for patriarchy and bigotry. One of the main anarchist slogans is ‘No Gods, No Masters’. Therefore, though ‘religion is stupid’ is not the best of slogans, we would expect literature and meetings exposing the problems of religion. And, being against religion does not make you a racist or a supporter of colonialism. The entire colonialist enterprise was crucially supported by both the ideology of religion and its practitioners, eg missionaries. The Bible was used to justify the slave trade and the incredible exploitation and repression of those colonised. Also, what does the common accusation of Islamophobia actually mean? If we are against religion then we are against Islam. Islam also is a religion originally spread by war and aggression, forcibly converting people as its jihadists spread out from the Arabian peninsular. And no one would agree with ISIS and the regime of brutality and reaction. What is important is that we think about how to go about making our points about religion. We have to make sure that we expose the general problems with religion without picking on just one, such as Islam which many racists do. Also, we may be anti-religion but we are not anti the people who are religious. Most people who practice a religion do not share the beliefs of the more radical right form of religions. This is why we would of course show solidarity with religious groups that are being attacked and discriminated against. In the campaigns and struggles we are in we will often be working with people who are religious. It is not the place to engage in attacks on religion. But that doesn’t mean we can’t do general propaganda against religion and support those who are experiencing repression because of it. Given the sentiments expressed in the statements, it is surprising that they are so supportive of religion. Certainly Christianity, Islam and Judaism would not be particularly supportive of men and women changing their gender. Patriarchy and distinct gender roles are a key part of all of these religions. However, they would not ‘call out’ religious believers or they would then be accused of being anti-Semitic, racist or Islamophobic! This contradiction is illustrated by the incident at Goldsmiths College a few years ago. There was a meeting organised by the secular society with a woman speaker from Iran. She has rejected Islam and was explaining the difficulties for women in Iran and the problems people have in rejecting religion. One would have thought this would be someone anarchists and all those fighting patriarchy would support. Instead of white European anarchists and feminists parachuting in and telling people what to do in a particular culture, the speaker was from the culture and was fighting religion and patriarchy from her own experience. This meeting was severely disrupted by the Islamic society, invoking the college’s ‘safer spaces’ policy. This is not surprising but what was surprising is the amount of support the Islamic society got from the Feminist and LBGTQ societies, as well as from other anarchists in the usual internet exchange. So we have anarchists supporting oppressive ideologies and practices in order not to be called ‘Islamophobic’! The main point of this statement is to stress that we have to keep in mind what we are actually fighting for. In the current period, with the world threatened by capitalism-fuelled climate change, wars and conflict, repression, nationalism and religious bigotry, immense suffering for vast numbers etc etc, we cannot afford to be fighting amongst ourselves. We would argue that creating a fundamentally different society is the only way out of an extremely serious situation: we would call this society anarchist or libertarian communism. Of course, we must stress all of these issues will affect certain groups more than others. That is why it is important to base a strategy and an analysis on an awareness of the way capitalism and the State amplify and reinforce systems such as patriarchy and racial oppression. We have to take into account the diversity of the working class and different experiences different groups and individuals have. Nevertheless, it is still necessary to come together effectively in order to have any chance of overthrowing the current system and creating a new society. This means that it is vital that we work out ways of overcoming serious divisions within the working class. These divisions are not trivial or secondary to class. However, without an overall class analysis which sees us united as a class against a ruling class and a system based on exploitation and power, it is too easy to get isolated and immersed in one’s own particular situation. The end result is a narrow political outlook, intense and bitter conflict (as we have seen) and a working class so divided that it is ineffectual. We need to think about how we can create such a united working class that at the same times takes oppressions within society and the class seriously. We believe that this would involve a critical look at the current political culture which is increasingly authoritarian and inward-looking. One key way of doing this is to get out of anarchist/activist ghettos and become involved in campaigns and struggles in both the workplace and community. Those of us who have been involved in community campaigns for example Residents Associations, fighting evictions or demolitions, saving markets etc find that we are working with a diverse range of people. We will not agree on a range of issues such as migrants and borders and the role of women in society and belief in religion. And, we would certainly find that many would have very conservative views on sexuality and gender. However, by working together with a common aim (and not on the internet!) there are opportunities to informally discuss many issues and explain our anarchist ideas on these subjects in a non-aggressive way. Also, many of the people involved in such campaigns and groups will not be the usual university-educated and/or white activists. Instead, we all get first-hand experience of different views and perspectives, offering first-hand experience of what we pay lip service to with the pious statements about building a movement that is more diverse, often couched in obscure, political language. We need to take a critical look at the language we use. The tendency has been to come up with a label for a viewpoint that we don’t agree with. This is usually labels like ‘racist’, fascist’, ‘sexist’ as well as ‘TERF’, ‘Islamophobe’, ‘middle class feminist’, ‘identity politics’. It is an easy way of dismissing the other viewpoint without actually engaging with the issues. This behaviour is found throughout political movements as well as in our daily lives. Even the practice of shouting abuse at the class enemy, eg scum or wanker, though immensely satisfying, does not actually help explain our views to the rest of the working class. What is needed is a very practical and thorough discussion of what the views and practices are and then if there is disagreement, the counter-argument can be explained clearly and logically. We also need to think about the use of the internet. The tendency to be aggressive, to denounce, apply labels and be quite abusive has escalated with the use of the internet. Unfortunately, it seems a large percentage of anarchists and other activists spend a large part of their political activity on forums and Facebook. These mediums make it much easier to inflame conflict rather than resolve it. Again, we need to come out of ghettos, and the internet is a kind of ghetto as people are only communicating with certain people within the activist milieu. Instead we need to be working together on activities, having discussions and socials and in general getting to know people who we never see but only exchange abuse with. It may sound melodramatic, but in many ways the fate of humanity depends on the ability of anarchists to get their act together and begin to build an effective revolutionary movement. We would like to work with others who want to do the same. Keep up to date with news and events from The Anarchist Communist Group. The Anarchist Communist Group (ACG) is a revolutionary class struggle organisation, set up in February 2018 by former members of the Anarchist Federation in Great Britain. Copyright © 2019 Anarchist Communist Group.